Good To Begin Well, Better To End Well: Mycenaean Culture! So it occurred to me today that I have been fudging the clothing of my characters in HELEN for approximately 120,000 words now, and it was about time that I did some research to at least make sure my fudged approach was something that I could get away with, and not totally, completely beyond wrong. Nobody wants to get called out on historical accuracy over a dress, after all. As far as clothing goes, we pretty much have frescoes. Jewelry is another story--grave goods and the like have been found and preserved, probably because metal doesn't decompose. There's a good image of men's clothing in a fresco (definitely click this first link!) on this website, and a great description of both men's and women's fashions (of which I make no guarantees about the source, but it SOUNDS right to me). Basically, men wore belted, short dress-like outfits, sometimes with short pant-like bottoms instead, which gave them freedom of movement. Common people probably went without a shirt altogether, and ran around in just a skirt or shorts. They don't seem to be all that fancy, except for detailing around the edges (image from wikimedia commons). This isn't all that different from Minoan dress-- Mycenae really kind of ripped off a lot of culture from Crete-- but in general, Mycenaean's were a little bit more conservative in style. This is more apparent in women's dress. 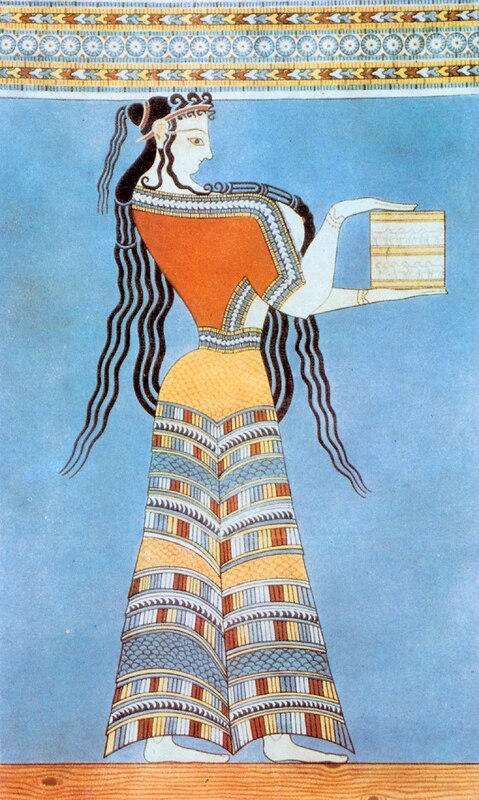 Contrary to later styles, Mycenaean's and Minoans wore fitted clothing. Women especially. 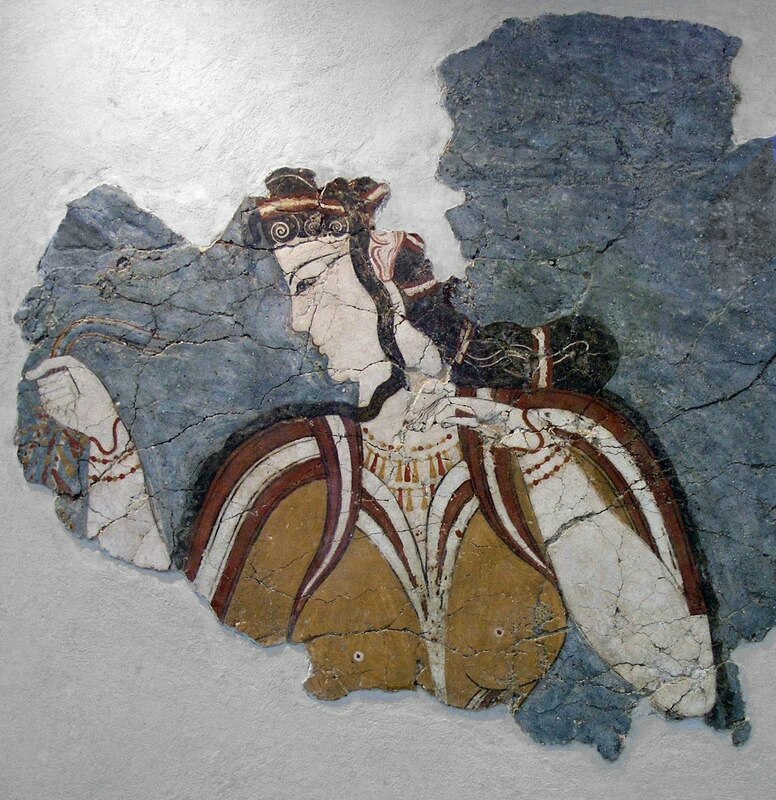 The image to the right is from a fresco, supposedly of a Mycenaean woman. (from wikimedia commons) You can see the detailing and complicated design of the skirt (do those look like pants to anyone else?) and the top. Minoan women, as far as we know, went bare breasted. Mycenaean women did not ALWAYS follow this convention, but as you can see, it wasn't unheard of. They usually wore a belt, to emphasize the waist and the skirt was kept full and flowing. Don't ask me how that kind of a shirt is practical at all, however. It seems like it would be a pain to keep on. The image to the right gives you an idea of what a top that covered the breasts would look like (from wikimedia commons). For the purposes of my book, I would expect that Helen dressed as conservatively as she was able-- being the most beautiful woman in the world would probably invite enough attention without showing off her breasts as well. Theseus is another issue altogether. 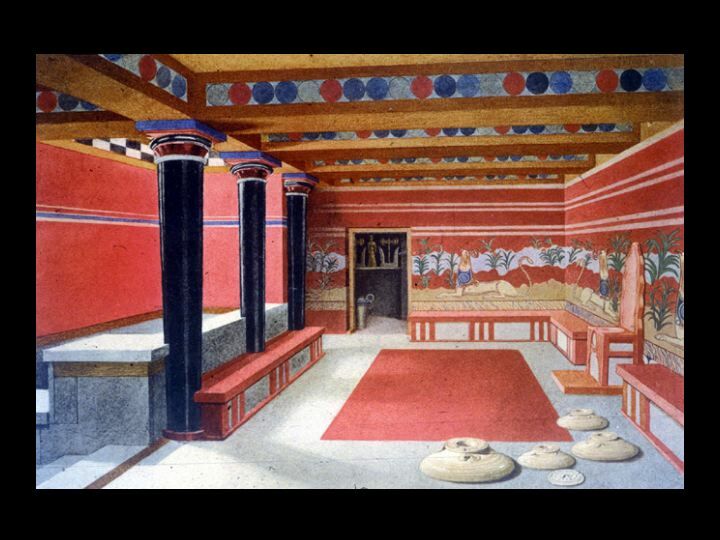 (and if you're wondering, no, Athens didn't have a Mycenaean (or Minoan) Palace of Awesome, either.) He was, by all accounts, a very successful king for Athens (until he got thrown out after the underworld debacle). I expect when he shows up somewhere, he does it in style to show off the wealth of his city and by association, his power as its king. Has my fudging been at all accurate? Well, yes and no. I'll probably need to go back through and tweak a few things. But honestly, there is no real way to write about the mythology of the Trojan war while maintaining BOTH historical and mythological accuracy (more on this in a future post, probably). What about you? Has there ever been an aspect of your book that you fudged, only to research and find out that you had it totally wrong? 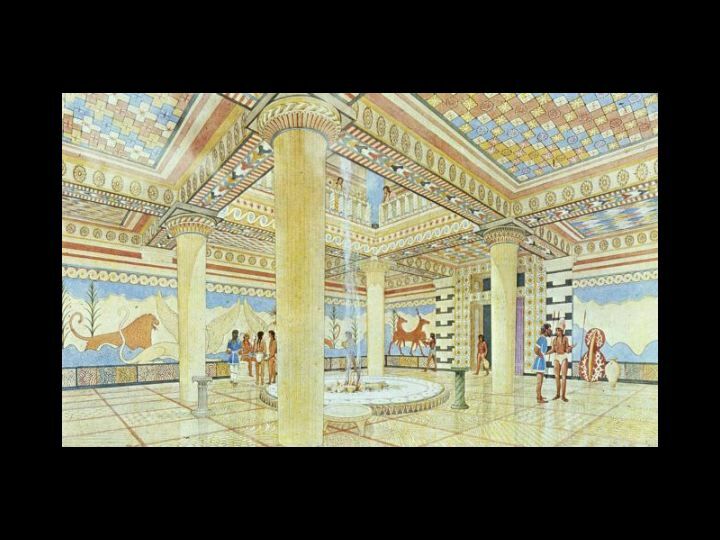 Also, am I the only one who looked at that rendering of the Megaron of Pylos and went WHOA? Talk about opulence! Very cool! Clothing is so hard to get right. This is a fine example of how to do it properly. Clothing is kind of a pain, especially when all you have are artistic depictions. Did you know some linen clothing was actually found in King Tut's tomb? I was pretty excited to see that- fibers just don't stick around like metal. Shame! That's awesome! It is kind of too bad about the historical black-out areas, where things just don't keep. But I also kind of love the mystery! Mycenaean and Bronze Age cultures are really fun to dig around in, because it's just enough information to whet the appetite, but not to sate it! Gets the wheels turning! I love the concept of maintaining mythological accuracy. Also, the men in short skirts. The bare-breasted women, though--I used to be able to rock that, but now if I went out that way, I might not even need a skirt. The teeth might not be as bad as you imagine, JL. The complete absence of sugar makes a *big* difference. You will though see extreme wear. Murr: thanks for stopping by! Unfortunately maintaining mythological accuracy is easier said than done, and it really doesn't match with the history it a LOT of places. I actually don't do a lot of description of clothing in general when I write. Only if it's important/special. But I find that it's easier for me if I have a general idea or catalog of pictures in my head to refer back to, if it comes up! Very neat post! I loved that rendering of the palace too. Clothing is way tough. When I was researching for my first novel, I found out about a certain element of battle gear that I used heavily in my story, but the everyday stuff was so hard to find (Germanic tribes) that I kind of fudged the rest towards Norse/ Medieval village tradition. That book will never see the light of day, but I remember being so frustrated that broad overviews were all that I could find. I really wanted a Discovery Channel show about their everyday life just then. L.T. : I know what you mean. If Helen weren't a princess I would be totally screwed. (And really, I'm fudging that particular aspect of history quite a bit-- Sparta was probably little more than a village during Mycenaean Greece.) Sometimes the daily life information just isn't there! I touch on Bronze Age Scandinavia in BoG, and we have virtually no information on what daily people did, or dressed like, then, too. There are a few burial mounds, but who those people are at all is a mystery, and certainly you can't apply it to the entire culture as a standard! I'm consistently amazed by the depth of your research, good lady. It makes me glad I've chosen to write contemporary literary fiction. Seriously! Thanks, Simon! I love researching and learning about this stuff, so it's no chore, even if it takes time. Gotta write what you love! I've already told you I love your research, right? I have a very real love affair with Greek Mythology. It interferes with enjoyment at times, but for the most part I try to let go and enjoy. I've never done anything quite like what you are doing yet, but I have an MG that will draw from mythology but I'm planning on making up much of it myself. Hopefully it doesn't offend anyone. I hate research, as you've probably noticed when reading my stuff. I did some research on dress, though, which is always fun. I found their makeup fascinating but maybe just because I'm obsessed with makeup already. Tara: This was actually pretty easy to find information about, once I knew what to look for. KM: Not his fault! It was Pirithous's idea to go to the Underworld! Incidentally, Plutarch blames Theseus's abduction of Helen for his entire downfall as a king. Love your blog--why did I never "meet" you before??! It's great here! I had some of the same difficulties with clothing, and also with residences. I settled on tunics and chitons and cloaks of some design or another for all characters. With battle dress, I became more detailed. As my stories so far are YA, I don't get but too racy with the clothing. As far as fudging goes, I prefer to call it injecting with my own brand of mythological fantasy. I embellished some things but never to the detriment of the story. All of my "fudging" enhances the story. And, while not strictly historical, I'm fine with that. If you are still interested, I can answer your questions about Mycenaean dress and other matters. I run a blog on Mycenaean and Minoan culture (see my name for a link), and have just published a novel, Helen's Daughter, set in that time period. I have always thought the same thing about the "pants". It reallly looks like pants to me. Even on the famous ivory statuette (or is it light wood?) of the two woman with their arms around each other and a toddler hanging on the lap of one of the women, it sure looks like pants to me. Maybe it's not, but I find it really bothersome that scholars never even seem to discuss the fact that, I'm sorry, it looks like pants! I guess they must have some other evidence that we don't have access to? Or there is an assumption that women could not possibly ever have been wearing pants? I don't know. It is very strange, I agree! Thanks for your comment! The women are not wearing pants, but a wraparound skirt. The pants-like crease you see is where the fabric overlaps. Same with the men; they're not wearing shorts, but wraparound kilts. Breasts were only shown during religious rituals; the frescoes and other art in museums is religious art. Sparta had a Mycenaean palace of Awesome, but only the basement has survived; the hill at Therapne is prone to wind erosion. That painting of the megaron of Pylos is an exaggeration. The actual site isn't that large. A typical megaron measured about 16 feet by 14 feet. The research I found suggested that the ruins at Sparta were not confirmed as a Mycenaean Palace establishment, but I'm glad to be wrong! Do you have any good links for that information? Regarding the women's skirts -- it's just funny to me that it so frequently LOOKS like them, and no one really addresses it. Kilts for the men does seem the most common, but some of my research also suggested that they did actually have shorts, too, though they're pretty rare. The reason your research doesn't confirm a Mycenaean palace at Therapne is because it was only recently (within the last 10 years) that archaeologists realized that the hill was prone to wind erosion. Bettany Hughes addresses the problem in her documentary Helen of Troy, and in her non-fiction book of the same title. Historian Bernice Jones has done extensive clothing research (with photographs, which she won't allow you to reproduce, because she's working on a book) which shows how the garments in the frescoes were produced. Remember, clothes back then were made by hand, and by women who also had to spin and weave their own wool. Pants are harder to make than a wraparound skirt, which is basically a rectangle with the flounces attached. 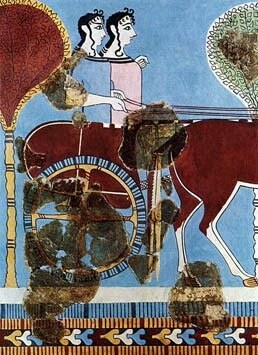 Kilts are more prevalent in Minoan art. You see more tunics among the Mycenaeans. Hunger Games Epic Contest hosted by Frankie!